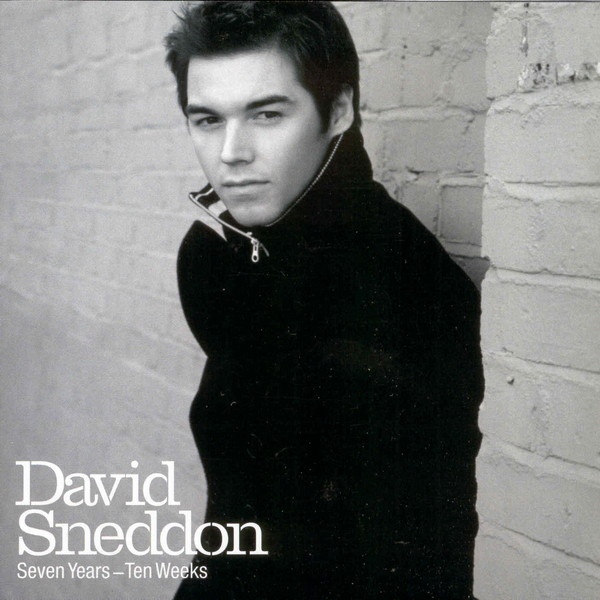 Today’s POP RESCUE from pop obscurity, is the debut album from Fame Academy winner David Sneddon – 2003’s Seven Years… Ten Weeks. The album opens with Best Of Order, the third and final single from this 12 track collection. A chattering crowded room opens the song, before David can be heard testing the mic. Bass, percussion and guitars lead David’s high tenor vocals into the first verse. This song is slick, up-tempo, and it flows perfectly, building to a rockier chorus that sounds like something Robbie Williams might have released. A roaring electric guitar gets a great solo about 2/3rds of the way, making this a great opener track. Time To Fall Down opens with piano and David’s soft vocals, which are pretty flawless here. Pace picks up vocally and musically, again building up as the song progresses. Again, I’m hearing plenty of Robbie here, but also some Beatles too. Debut and lead single, Stop Living The Lie is up next. This song was performed by David on Fame Academy, and subsequently went straight to number one. This is a piano-led, self-penned ballad, and essentially it’s a great 80’s power ballad, and one that sounds like it would have made it into Elton John‘s record collection. Piano opens fourth track All My Life, before David’s gentle, rich, vocals begin. A synth leads the song on before a loud snare drum kicks in, backed by a rich strings synth and bass. The piano, bass, and chorus singing in this song reminds me a lot of Gabrielle‘s hit Rise, but of course, that in turn is actually a sample of Bob Dylan‘s hit Knockin’ On Heaven’s Door from 1973. Either way, the similarity is definitely there, but there’s no credit (fight it out yourself, lawyers!). The lyrics seem to be giving a nod to David’s previous musical projects – including his time busking in Edinburgh (‘Standing on the corner of a street where nobody goes, And it looks like nobody cares, though you never stop peddling your wares – yeah’) he sings. Snarling guitars signal the arrival of Follow Me, and this song definitely sounds vocally and musically like something that fell off the I’ve Been Expecting You album by Robbie. It’s fast, furious with guitar, and at times has a bit of a gospel feeling to the chorus. Don’t Let Go follows this – which acted as the second single from the album. We’re back to piano ballad territory here, but this one almost sounds musically like it could have been a Bond Theme thanks to strings, piano, and dramatic drop-out sections. Sneddon’s vocals could probably handle a Bond Theme. This song deserved it’s #3 UK single chart position, but should have reached #1, as musically and vocally it’s far stronger, more interesting and just ‘better’ formed than Stop Living The Lie. Up next is The Bluebird, and this has a great thrashing beat thanks to bass drum, snare and piano that is clunked along in time to the beats. David’s vocals have plenty of space to show off here, and he makes light work of it, although the song isn’t particularly catchy. There’s a roaring guitar solo towards the end, which just about manages to shake off the Elton similarity. Eighth track Lazy aptly slinks its way in, wonderfully downbeat, but sounding a lot like Portishead‘s hit Glory Box with added rock guitar. This is a good thing – as this song really stands out amongst the rest of the tracks, and gives Sneddon’s vocals something new to do. This is followed by OK, which feels like it refers back to his Fame Academy time with lyrics like ‘It takes forever to convince them that you’re who you say you are, they like to judge you but you know they’ll only do it from afar’. At times, this song feels a bit like it’s taken from a musical – possibly with John Barrowman on vocals. There’s not much to latch on to with this song… it is… just.. OK. Without You is up next, and this is another slow ballad, but one that has musical nods to his native Scotland throughout. Some gentle rumbling drums add to the song about 1/3rd of the way in, and this grows as more celtic sounding instruments join in. For the penultimate track, David channels more Robbie and John Barrowman, as he sings Let Me Entertain You Neverland, which turns a bit disco after about a minute. To it’s credit its chorus is fairly catchy, but there’s little else to write home about with this track. The album closes with Long Time Coming, which opens with some beautiful acoustic guitar. David’s flawless vocals in this track, are joined by some organ, handclaps, great backing vocals, and a nice guitar riff – but all of these keep out of the way, allowing his voice to shine to the end with considerable range. …but at 10mins 5s, the end is indeed a Long Time Coming, as secret track I Love You is tucked up at 6min 8s. This track again uses acoustic guitar and pitches that against David’s vocals. There’s something lullaby-ish and delicate about this song, and feels somewhat personal. It is beautifully made. Over all, this sounds like the best duets album never made by Elton John and Robbie Williams. Unsurprisingly, it’s producer Hugh Padgham at the helm, who led Genesis and Peter Gabriel albums in the 1980s, and this album was recorded with Elton John’s band. There’s no denying David’s talent as a musician and a singer, and this album is entirely original – unheard of for a talent show contestant. That’s to his credit, although stylistically, there’s not a wide range here. The sleeve reveals the origins of the album’s title: ‘I’ve been a musician for 7 years. To anyone with half a brain, 10 weeks on a TV show is nothing’. Where is David Sneddon now? David Sneddon released a fourth single in 2003, shortly after the third single here, title Baby Get Higher, but despite it’s catchiness, it stalled at #38 in the UK singles chart. He released White Noise, a five track EP after this album, but whilst it didn’t recapture the success of his initial single. Whilst David has not released any music since the EP under his own name, he has successfully gone on to work with James Bauer-Mein to write and produce as a highly successful production duo, for a host of high end artists like Hurts, Newton Faulkner, Olly Murs, Morten Harket, Pixie Lott, Will Young and Lana Del Ray, under the pseudonym of The Nexus. POP RESCUE COST: 50p from an eBay seller. Posted in 2000s, David SneddonTagged 2003, album, Best Of Order, Don't Let Go, Fame Academy, Hugh Padgham, review, Seven Years... Ten Weeks, Stop Living The Lie, The NexusBookmark the permalink.